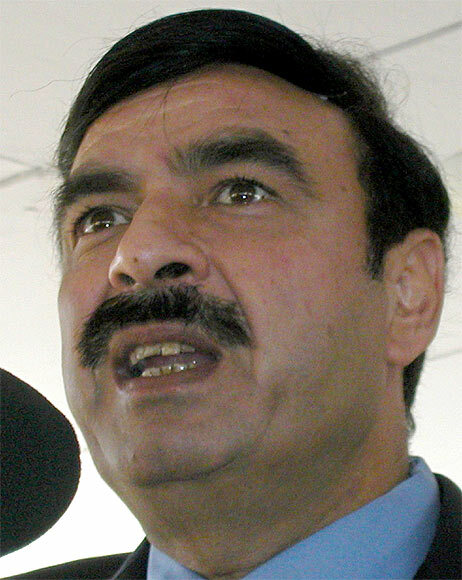 A senior Pakistani politician and a former member of the Musharraf cabinet, Sheikh Rasheed Ahmed, who was detained at the Houston airport on arrival on June 27 for his alleged links with Lashkar-e-Tayiba and freed after five hours of interrogation, used to run an Inter Service Intelligence-funded training camp for Kashmiri militants in the garrison town of Rawalpindi when the armed struggle in Jammu and Kashmir was at its peak. Having detained the former information minister and chief of the Awami Muslim League, the American immigration staff took his two mobile phones into custody and copied all the data on the phones, including phone numbers. Sheikh Rasheed Ahmed was told that he was being interrogated under directions from Washington, DC, despite the fact that he had a multiple-entry United States visa and he was set to leave for Dubai after two days. He was eventually released after Pakistani ambassador to the US, Sherry Rehman, officially lodged a protest with the US state department. US media reports say Rasheed was detained for his links with Hafiz Mohammed Saeed, the LeT founder and the alleged mastermind of the 26/11 Mumbai terror attacks. In the recent past, Rasheed had actively attended rallies and meetings organised by the Defa-e-Pakistan Council, an ISI-sponsored coalition of pro-Kashmir extremist groups formed by Hafiz Mohammed Saeed, who also heads Jamaatul Daawa. Considered close to the Pakistani military and intelligence establishment, Sheikh Rasheed Ahmed had accompanied Hafiz Mohammed Saeed to a series of rallies and press conferences that were held in Rawalpindi, Karachi and Lahore where they made harsh statements against India and the US. Rasheed, one of the few Pakistani politicians to have served not one but two military dictators (Zia and Musharraf), has always been a colourful character, mixing populist rhetoric with the idiom of the street which borders on the crass. He is famous for his tongue-in-cheek political one-liners that aim to demean anti-establishment opponents in the style of folk jesters. While Pakistanis are well aware of his patronage and facilitation of groups linked to armed resistance in Kashmir, it really came to media limelight when the Indian government denied him permission to visit New Delhi in 2004 after Kashmiri leader Yasin Malik publicly disclosed that Sheikh Rasheed's residence and farm house have been used by jihadi organisations. Therefore, when the Jammu and Kashmir Liberation Front chairman Yasin Malik stated at the Marriot in Islamabad on June 13, 2005, that Sheikh Rasheed had the honour of having trained around 3,500 jihadis in guerrilla warfare, it was not at all surprising for those who are aware of his past as someone who had been a hardened militant with intelligence connections and who wanted to liberate Jammu and Kashmir with the might of the gun. Yasin Malik declared: "Sheikh Rasheed has played a great role for Kashmir's liberation. He used to support the frontline jihadis from Kashmir, but few know of his contributions." Perhaps, in the euphoria of reliving the past or overwhelmed by gratitude, Yasin Malik went on to spell out Sheikh Rasheed Ahmed's role in Kashmir's militant movement at a reception arranged by Sheikh Rasheed Ahmed, then information minister, in his honour: it was at the information minister's farmhouse that some 3,500 Kashmiri jihadis, including Yasin, received training in arms. From the reformed militant leader's perspective, there obviously couldn't have been a better tribute to shower on another Kashmiri before an august audience. But the politician in the unruly Sheikh realised that even in these days of Indo-Pak bonhomie, it is not possible to accept as minister a man who could have trained militants to wage jihad in Kashmir. When journalists questioned him after the meeting was over, he tersely remarked, "I have no idea about which Sheikh Rasheed he (Yasin) is speaking." under pressure from a somewhat embarrassed and equally perturbed Sheikh Rasheed, the visiting Kashmiri leader Yasin Malik had to rephrase his earlier statement by saying, "I have been misquoted by the media. What I said was that Sheikh Rasheed used to give shelter to the Kashmiri freedom-fighters at his Rawalpindi farmhouse. I never talked about a military training camp being run by the information minister there in the 1980s." The same day, on June 14, Sheikh Rasheed issued a "policy statement" saying that "it had never been his policy to train militants". The federal minister said this when his comments were sought on a statement issued by the external affairs ministry's official spokesperson at a press briefing in New Delhi. "I am a politician, not a militant, and I strongly support the peace process between India and Pakistan," he added. What Sheikh's policy statement proved was that it is always easier to persuade a militant to give up jihad than to inject in him the culture of popular politics demanding doublespeak and concealment of an unsavoury past. However, a former close associate of Sheikh Rasheed had refuted his claim while requesting anonymity, saying that the late JKLF commander, Ashfaq Majeed Wani, was in charge of the training camp (called Freedom House) which was located at Sheikh Rasheed's 250-kanal farmhouse in Fateh Jang, Rawalpindi. The camp was being funded by the ISI, under its then director general Lt Gen Hamid Gul. But there are those who believe that the liberation of Jammu and Kashmir might not have been Sheikh Rasheed's sole motive and that he had actually rented out his farmhouse to the ISI for a hefty sum of money. As journalists dug up his past, the poor Sheikh found himself contradicted not only by Pakistan Peoples' Party, during whose tenure the training camp used to operate, but also by General (retired) Mirza Aslam Beg, who was the army chief at that time; Major General (retired) Naseerullah Babar, who was the interior minister in Benazir Bhutto's cabinet; Amanullah Khan, chairman, Jammu and Kashmir Liberation Front; and Hashim Qureshi, a co-founder of the JKLF who hijacked an Indian Airlines aircraft to Lahore in 1971. Conceding that the ISI gave military training to Kashmiri rebels battling security forces in Kashmir, JKLF chief Amanullah Khan disclosed: "We had a gentleman's agreement, an oral sort of agreement. I was given assurance that the ISI was all out for the independence of Jammu and Kashmir," he said while referring to beginning of ISI assistance for his JKLF. "I was given the impression that Pakistan's then military ruler, General Ziaul Haq, also supported the notion of independence for Kashmir. We began bringing young men into the Pakistani administered Azad Kashmir from the Indian side in 1988, where they received training from the ISI. "The agreement was that we will bring boys from across the border and indoctrinate our ideology by ourselves while the ISI will train them and send them back. The ISI training for our group ended in early 1990 after the agency tried to interfere in the JKLF affairs." Similarly, while confirming Yasin Malik's statement, a PPP spokesman said: "Freedom House in Rawalpindi was a militant training camp. In 1989, the PPP government had learnt that the ISI, without the government's clearance, had given to then opposition member Sheikh Rasheed Ahmed hundreds of kanals of land in the suburban areas of Rawalpindi. The government had also learnt that the land was given to him to support the Kashmiri groups. But, as the military was under the president, there was little the government of the day could do about it constitutionally." Asked about the fate of the Rawalpindi training camp, a retired intelligence official said it was shut down by the first government of Prime Minister Nawaz Sharif in 1990 and was relocated in Pakistan-Occupied Kashmir. The move to shut down the Fateh Jang training camp was actually initiated by the first government of Prime Minister Benazir Bhutto and finally materialised by the first government of Prime Minister Nawaz Sharif. However, there are those in the militant circles who insist that the Freedom House training camp was shut down after the establishment chose to back militant Kashmiri groups, instead of secular groups like the Jammu and Kashmir Liberation Front.